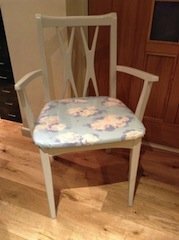 A hand painted cream solid wood high back hall chair, upholstered to the seat in pastel coloured vinyl. 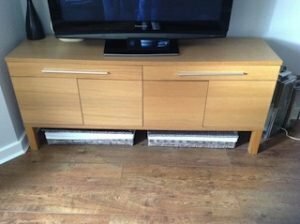 A solid oak television unit, together with a black Panasonic 32 inch flat screen television. 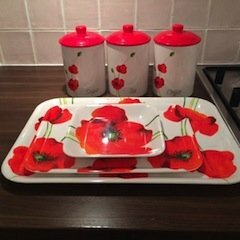 A collection of red and white poppy patterned kitchen accessories, to include three trays and ceramic tea, coffee and sugar canisters. A collection of kitchen accessories, to include white polka dot saucepans, cutlery, utensils etc. 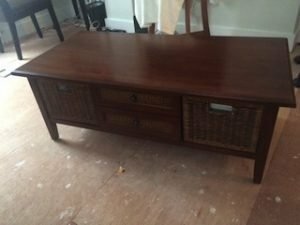 A solid wood rectangular large coffee table, having a wicker drawer to either side of two central drawers. 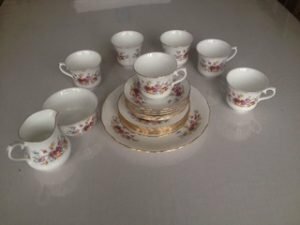 A Queen Anne rose and gold patterned China part tea service, to include a milk jug, a sugar bowl, teacups, saucers, side plates and a tea tray. 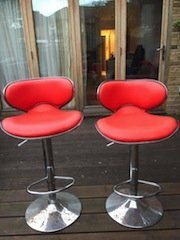 A pair of tall retro chrome curved back swivel breakfast bar stools, upholstered to the seats in red faux leather. 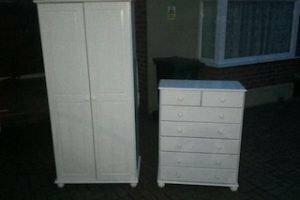 A tall standing white solid wood double wardrobe on ball feet, together with a matching chest of drawers. 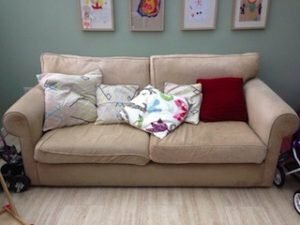 A two seater high back sofa upholstered in stone cotton, together with various colourful cushions. A black, stainless steel and glass large capacity Cookworks blender. 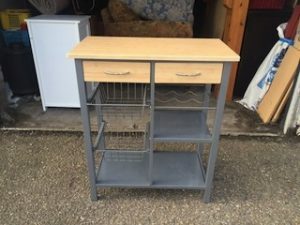 A tall standing solid pine and metal butchers block, having two drawers above a wine shelf, two metal baskets and two shelves. 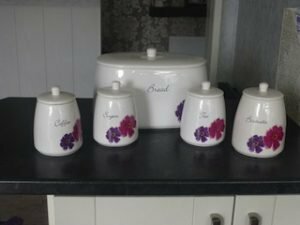 A set of white floral patterned ceramic kitchen canisters, to include a large bread bin, a biscuit barrel and tea, coffee and sugar canisters. 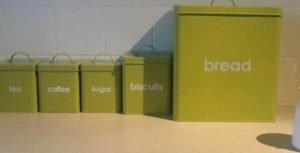 A set of lime green tin kitchen canisters, to include a large bread bin, a biscuit tin and tea, coffee and sugar canisters. 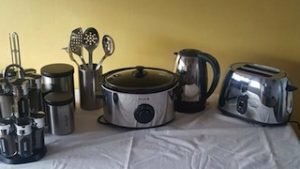 A collection of stainless steel and black kitchen accessories, to include a slow cooker, a kettle, a utensil holder, utensils, spice jars and spice rack etc. A tall standing white Samsung American fridge freezer with built in ice dispenser. 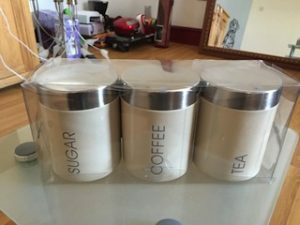 A brand new boxed set of cream and stainless steel cylindrical tea, coffee and sugar canisters. 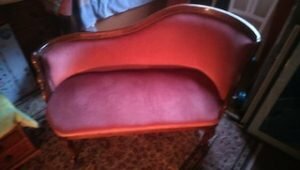 A vintage solid mahogany curved back chaise lounge sofa, upholstered in salmon pink velour. 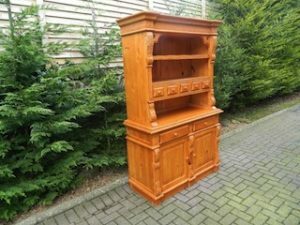 A tall standing solid pine farmhouse kitchen dresser, having a plate shelf above five small drawers, two large drawers and two cupboards. 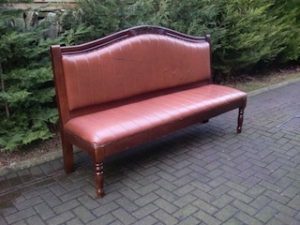 A large solid mahogany heavily carved three seater bench, upholstered in terracotta authentic leather. 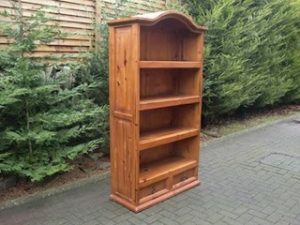 A tall standing solid pine curved top book case, having four shelves above two drawers.